The configuration of spins in a Néel skyrmion. Credit: Zhang et al. In recent years, excitement has swirled around a type of quasi-particle called a skyrmion that arises as a collective behavior of a group of electrons. Because they're stable, only a few nanometers in size, and need just small electric currents to transport them, skyrmions hold potential as the basis for ultra-compact and energy-efficient information storage and processing devices in the future. Now, a research group in Singapore has used computer simulations to further probe the behaviors of skyrmions, gaining insight that can help scientists and engineers better study the quasi-particles in experiments. The new results, published this week in AIP Advances, could also lead to skyrmion-based devices such as microwave nano-oscillators, used in a range of applications including wireless communication, imaging systems, radar and GPS. "Its unique attributes, for instance, could theoretically enable notebooks with hard drives the size of peanuts, and yet consume little energy," said Meng Hau Kuok of the National University of Singapore and one of the work's authors. 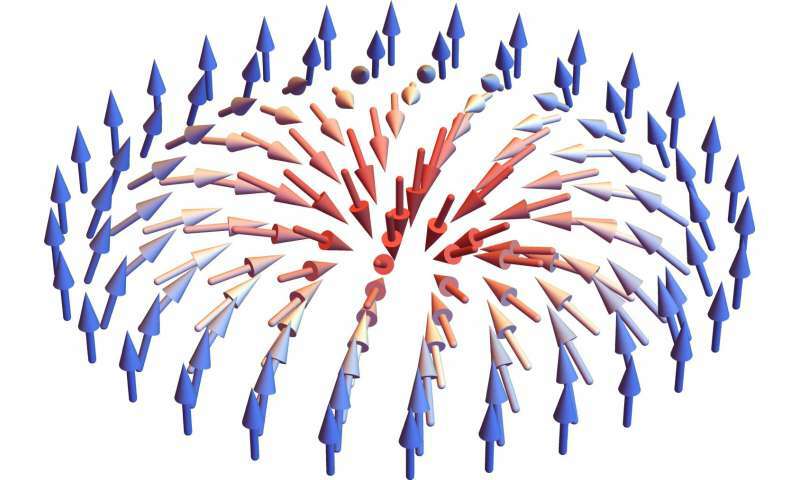 Observed in 2009, skyrmions arise from the collective behavior of electrons in magnetic materials under certain conditions. Due to their spins, the electrons act as tiny magnets where their magnetic poles align with their spins. A phenomenon called the Dzyaloshinskii-Moriya interaction (DMI)—which occurs at the interface between a magnetic layer and a non-magnetic metal—tilts the spins and arranges them into circular patterns. These circular arrangements of spins, which behave collectively like particles, are skyrmions. Although researchers have studied how groups of skyrmions behave, little is known about their internal behaviors, Kuok said. In particular, physicists don't fully understand the particles' three fundamental modes, which are analogous to the fundamental vibrational modes of a guitar string corresponding to different musical notes. Like those notes, each skyrmion mode is associated with a certain frequency. "The modes can be thought of as circular patterns of spins dancing in sync," Kuok said. Understanding the modes is essential for knowing how the particles would behave. In one of the modes, called the breathing mode, the pattern of spins alternately expands and contracts. In the two other modes, the circular arrangement of spins rotates in the clockwise and counterclockwise directions, respectively. The researchers focused on a type of skyrmion called the Néel skyrmion, which exists in ultrathin films deposited on metals with a strong DMI. Using a computer, they simulated how the DMI and external magnetic fields of varying strengths affected the modes and properties of the particles. They found that given the same DMI strength, and if in the crystal phase, the frequencies corresponding to each mode depend differently on magnetic field strength. Increasing the magnetic field also induces the skyrmions to change phase relative to one another, from being arranged in ordered arrays like a crystal to randomly distributed and isolated. The researchers found that the three modes respond differently to this phase transition. Surprisingly, Kuok said, all three modes can exist in the crystal phase, while the clockwise rotational mode does not exist in the isolated phase. One reason, the simulations revealed, might be that the skyrmions are farther apart in the isolated phase than in the crystal phase. If the skyrmions are too far apart, then they can't interact. This interaction might be necessary for the clockwise rotational mode, Kuok said. Because the mode frequencies of skyrmions are in the microwave range, the quasi-particles could be used for new microwave nano-oscillators, which are important building blocks for microwave integrated circuits. A microwave nano-oscillator based on skyrmions could operate at three resonant frequencies, corresponding to the three modes. An increasing magnetic field would lower the resonant frequencies of the breathing and clockwise rotating modes at different rates, but increase the resonant frequency of the counterclockwise rotating mode. Such a skyrmion-based device would be more compact, stable, and require less energy than conventional, electron-based nano-oscillators. But before skyrmions find their way into devices, researchers still need to engineer their specific desired properties, such as size, and precisely tune their dynamic properties. "Our findings could provide theoretical insights into addressing these challenges," Kuok said. It would be nice to have a fuller description of the breathing mode.